It's been three years since we lost all the hours to bug catching and fishing in Animal Crossing New Leaf but that doesn't mean it has to be taken out to the 'farm' where it can chase butterflies in the fields all day. Nintendo has revealed that the life sim is getting an update in autumn that will give it Amiibo compatibility. 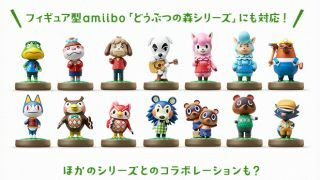 This will work with both the cards that you might have already been using for Animal Crossing Happy Home Designer and Amiibo figures. Bear in mind that to use Amiibo, you'll need the New 3DS console or to use a separate NFC reader with the original 3DS. The Amiibo compatibility won't just stop at Animal Crossing either. It looks like Splatoon will be getting in on the action too if you fancy covering your mortgage free house in paint. What's interesting too is that this is the same time period planned for Animal Crossing's mobile app which Nintendo has already said will have connectivity to game dedicated consoles. Exactly how the apps will link up is unclear but the fact there is some level of connectivity is definitely interesting. It won't be beating Pokemon Go any time soon but it looks like Nintendo is continuing the mobile offensive.